The weather on Labor Day could not have been any worse or any better for brewing. Cold and rainy most of the day with temps in the upper 50’s made for a great day to stay in and brew. The brewhouse was a nice 70 degrees most of the brew session and the only down side was the walk in the rain to empty the spent grains. Last year I started my Gueuze project with 5 gallons still in a secondary. The other 5 gallons is now a Kriek that I have on tap. The 5 gallons I spoke of had Wyeast 3728 Lambic blend added first then Russian River dregs and Cantillon dregs along the way. This year I have a new brew system so I was able to brew 20 gallons of base Lambic and have more variety to play with in a year! 11 gallons (Al’s Bugfarm 4), 5 gallons (Fresh Wyeast 3728 no starter and RR Sanctification dregs), 5.5 gallons (1 year old Wyeast3728 no starter, a fresh vial of WL Brett Lambicus, and a few grains from the grain bucket). Pitching temp was 65 degrees and held at that temp for 4 days. Garage temps now. The raw wheat was hell on earth to mill. The first time I ended up emptying the hopper out because the drill just couldn’t turn the rollers to crush the wheat. I ended up having to start the mill with nothing in the hopper and slowly add the grain until all of it was milled once. After that I could just fill the hopper with the wheat and it was like a normal mill. I ran it through my Barley Crusher 4 times. I’m told that the old school Corona mills will rip through raw wheat with no problem….next time I’ll use one of those. The next step was a cereal mash. 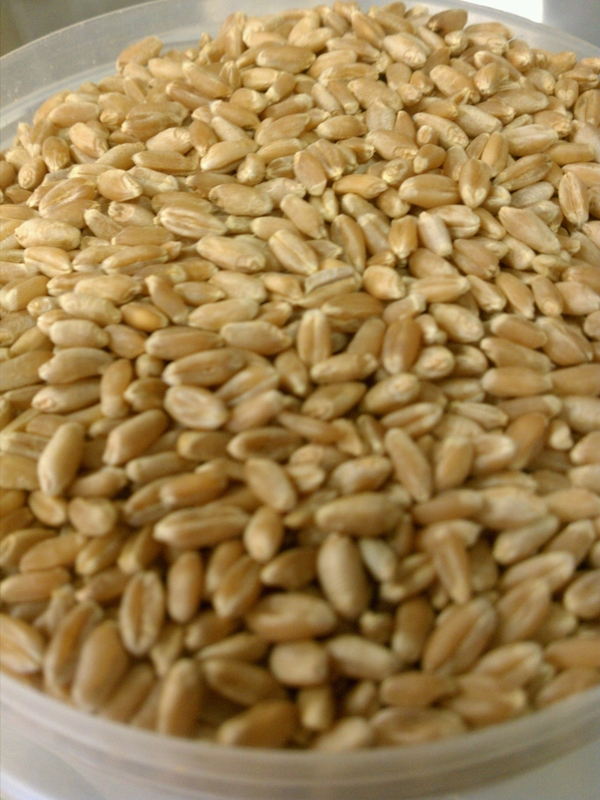 In a different pot I added the milled raw wheat along with about 10% of the Pale Malt (milled of course) to a heated water ratio of 1.1qt per pound. 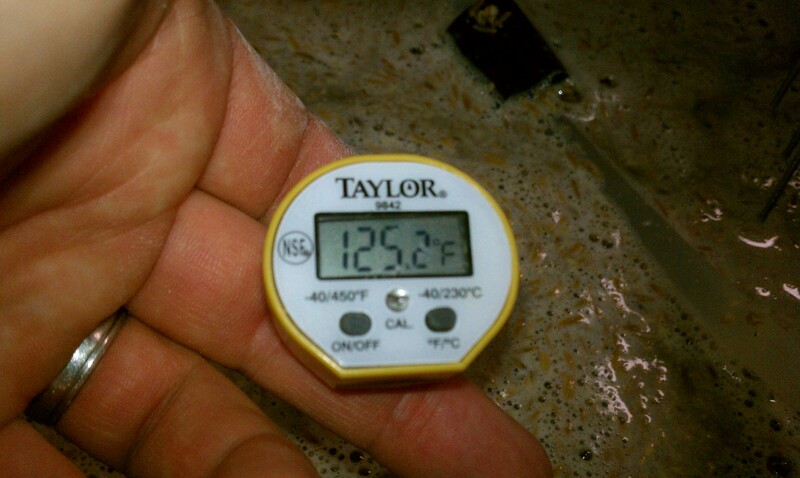 The infusion temp in the cereal mash was 155F which I held that temp for 20 minutes. I slowly brought the mash up to a boil. It was held at a boil and stirred to prevent scorching for around 40 minutes. 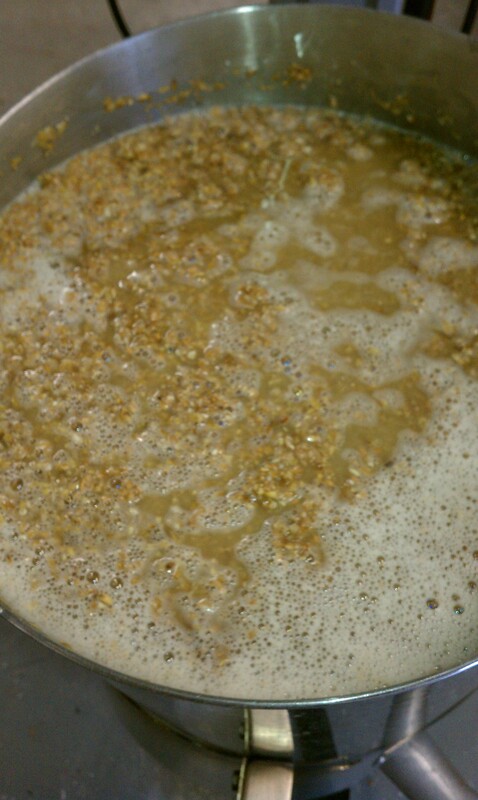 With 15 minutes left in the cereal mash I started the mash of Pale Malt at a rest temp of 125F. When that short step conversion was finished I added the cereal mash (along with some rice hulls) which settled out on a mash temp of 155 which was held for 60 minutes. I had no issues with running off or sparging. Everything went like any other mash. The run off was very cloudy due to the wheat and process which made me happy because I felt like it was going as it should. One thing to note. At the end of the boil there was so much protein the in the boil kettle. I have never seen as much sticky protein in the boil kettle even when I have used 55% malted wheat! Just remember that when using the raw wheat, it could clog a screen or a plate chiller pretty quick. 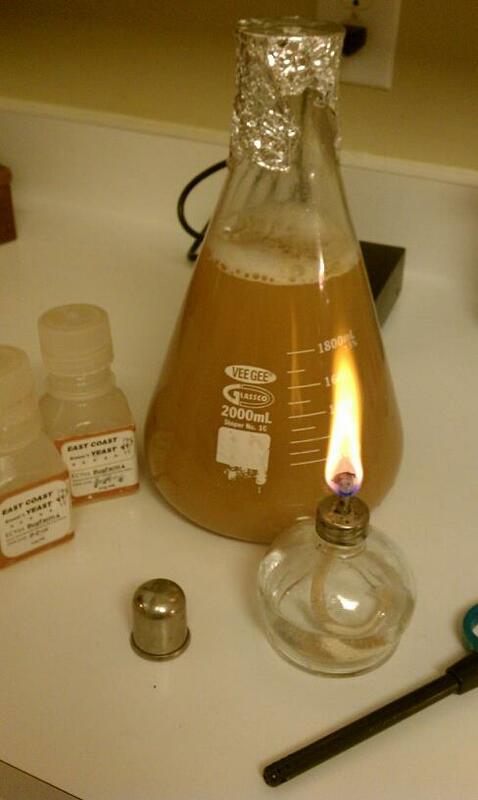 Once the brew day was finished I pitched all the different yeasts into their respective carboys. 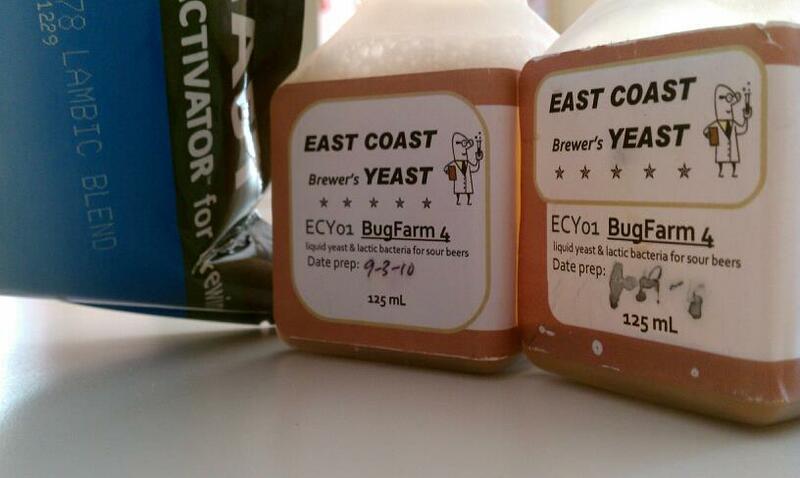 The two I want to show you though are the East Cost Yeast Bug Farm 4 pitched carboys. 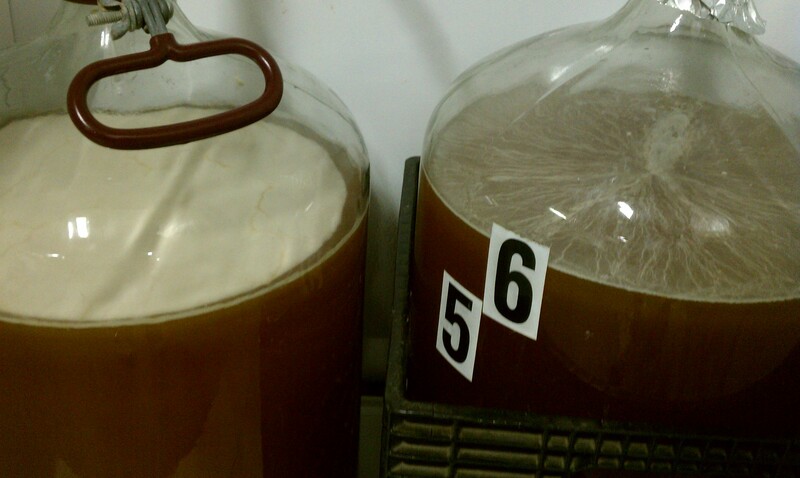 Below you can see the two carboys which were basically equal volume of the same wort, same temp and got basically the same pitch of yeast from the flask you see on the right. Each got 1000ml of the 2000ml that had been going on the stirplate for around 8 days. This is why I love sour and wild brewing so much. Even though I did all of the above, the soon to be beers decided to begin their life differently. 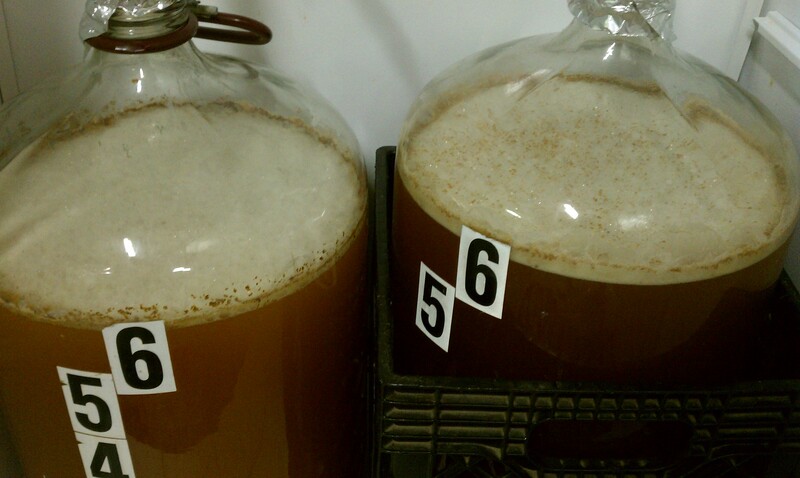 By day 3 the one of the right formed a pellicle while the one on the left went with a normal Krausen. 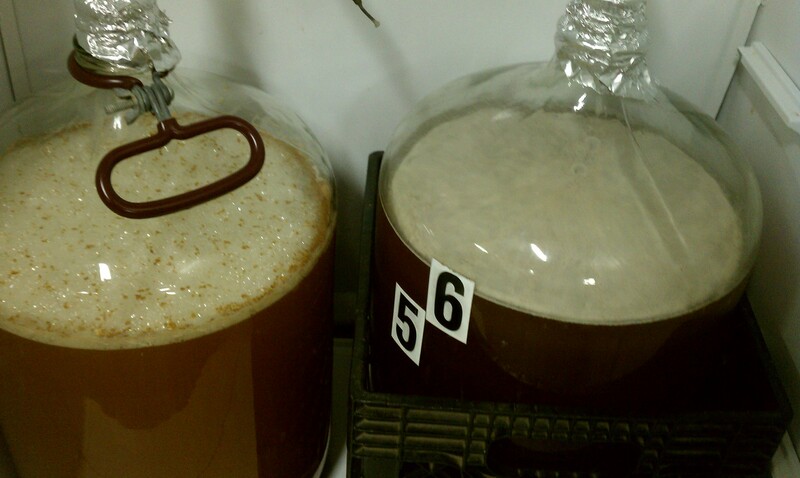 The other picture shows this morning (Day 5) that the one on the right finally formed a krausen. It will be interesting to see just how different these turn out next year! and something else I can’t remember right now. It’ll be interesting to follow your progress over the next couple of years and see how it compares to mine. 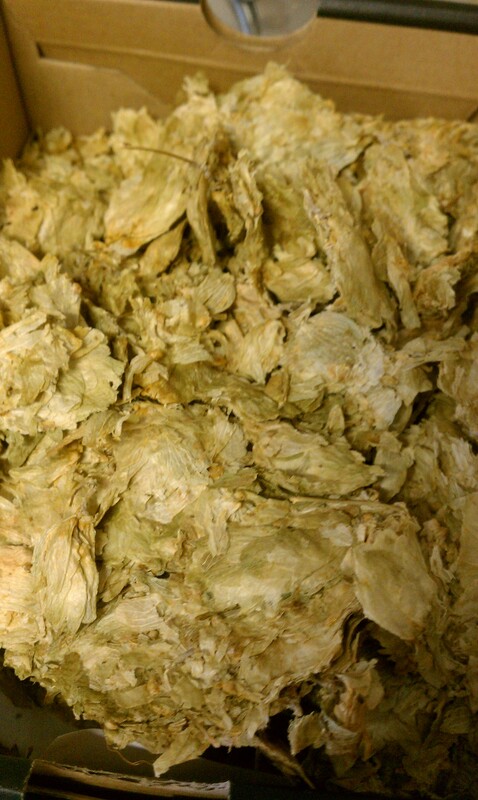 Brandon… or beercrafter if you’ve had experience, have either of you ever aged any homegrown hops? This is my first year growing and I ended up with more hops (mostly Goldings) than expected. I’ve just had my second harvest and had ~40 ounces wet. I don’t have a use for them right away and have thought some about aging them to use later. I’ve dried them out and I’m trying to figure out the best way to store them for aging. I’ve thought of using just plastic grocery sacks or possibly some of those reusable cloth grocery bags. I have a dark closet that’s hardly ever used that I’m considering putting the bags in to be “forgot about” for a few years. Any experience in this department, or suggestions? I’m a little lost here. So you pitched all 11 gallons with Bugfarm. 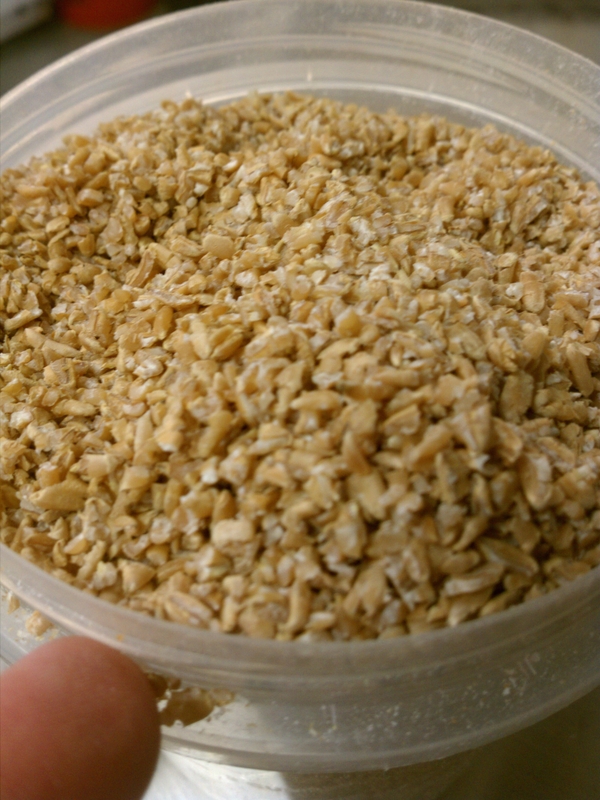 Then split the batch and put additional dregs/yeast in each batch?? Two Carboys got 5.5 gallons of wort totaling 11 gallons with Bugfarm 4, Another carboy got 5 gallons with Wyeast 3728 and and RR Sanctification dregs and another carboy got 5.5 gallons 1 year old Wyeast 3728 no starter plus a fresh vial of WL Brett Lambicus. That brew day was a total of 20 gallons into 4 carboys divided as above.